When we share our life with a dog, one of the things that often comes up is our dog’s age compared to our own. As both human and dog grow older changes are noticeable in energy levels, sleep time and desire to play. But our dogs age much faster than we do. Calculating our dog’s age has historically been based on the assumption that one human year is equal to seven dog years. But is this true? What is the best way of working out dog years compared to human years? Despite the prevalence of the one to seven rule, ageing a dog isn’t that simple. Although it’s been around since the 1950’s, the seven-year calculation was based on the loose assumption that people lived to around seventy years of age while dogs lived to around ten resulting in the seven to one percent. This view of how dog’s age assumes that as a dog’s life is much shorter than our own, it just flashes past at a much faster rate proportional to our own. However, if we work the calculation backwards and accept that we age seven times slower than dogs, we would be living to the ripe old age of one hundred and fifty. Not to mention producing offspring before our tenth birthday. A dog ages differently to us, ageing faster at the beginning of their lives and more slowly towards the end. 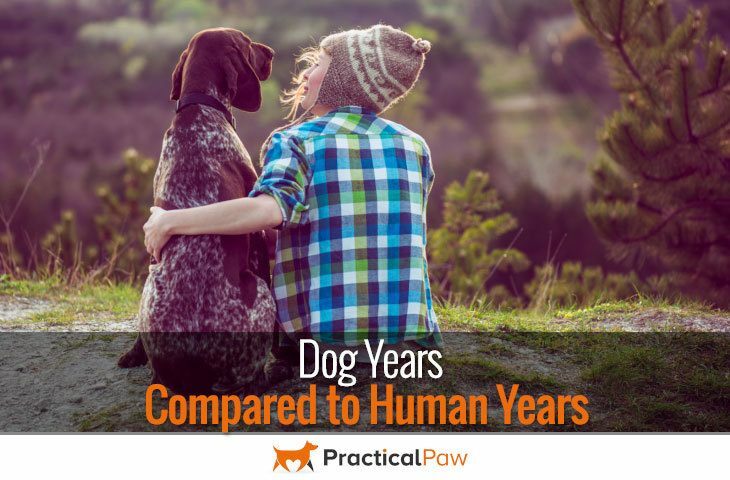 Although this makes accurately ageing a dog more difficult, as our knowledge grows about our dogs so does our ability to guess dog years compared to human years. So, what other factors matter in ageing a dog? Regardless of the method of guessing a dog’s age, it is a fact that the life expectancy of a dog is closely related to their size. Although it’s not clear why big dogs age faster than small ones, it does seem that the bigger the dog, the faster they age. Giant breeds, such as Great Danes, St Bernards and Newfoundlands among others age much more rapidly than their smaller counterparts. The average lifespan of a giant breed is only around six or seven years. Whereas small breeds like Jack Russells or miniature Poodles regularly live beyond fifteen or sixteen years old. This size related ageing appears to be almost unique to dogs as most large mammals live longer than their miniature contemporaries. The elephant, for example, lives for sixty to seventy years, in contrast, the mouse lives for a puny two to three years. While it’s true in the main that small dogs have a greater life expectancy than large dogs, there are exceptions. Alaskan Malamutes, Pointers and Collies are likely to reach the upper limit at around fifteen years. In contrast, the diminutive French Bulldog and the charming King Charles may only reach the lower limit of around nine years old. It’s also true that crossbreed dogs outlive their purebred counterparts on average by just over a year. The oldest dog ever recorded was a medium sized Australian Cattle dog named Bluey. Bluey lived to be just over twenty-nine which would be equivalent to two hundred and three human years using the old seven to one rule. So how do dogs age? Dogs don’t mature in the same way that we do. Whereas our journey to maturity is an incrementally smooth affair, the first two years of our dog’s life is a rush from puppyhood to adulthood. In the first year of our dog’s life, they develop so rapidly that it’s comparable to fifteen years of our existence. Our dog’s accelerated growth means that by the time they reach two years old they are the equivalent of twenty-four human years. After the first two years, the ageing process slows to around three to five dog years for every human year depending on breed and size. So the average dog is fully grown and sexually mature by the age of two. Although there are differences between online calculators, in general, most follow the guidelines from the Amercian Veterinary Medical Association. As size plays such an important role in the lifespan of our dogs, to get the most accurate estimation of your dog’s age you need to know what size bracket they fall into. While none of us would ever think of our dogs as average, the overall middling lifespan of any dog is twelve years. Our dogs do not get to spend nearly as much time in this world as we do. As they age, they go through similar physical and mental changes that we do. Ensuring that your dog has a good diet, is exercised both mentally and physically and is happy in their life has the potential to extend the time they spend with us. So when calculating your dog’s age keep in mind that what we may consider as a senior dog, seven years plus still has plenty of life ahead of them. After all, age is just a number and your dog has no idea whether they are aged or not!